Sales resurgence by Toyota shows 2012 Toyota Prius c and 2012 Camry Hybrid models are driving volume up. Automakers are riding a wave of volume and Toyota has been lifted by the rising tide due to strong sales of the 2012 Prius c (which Toyota calls the Prius c 12) and the 2012 Camry. In years past the hybrid models were always afterthoughts when it came to production volume for Toyota and other manufactures. That is no longer the case and hybrid models volume now, if they were excluded from overall sales, would mean the difference between growth and contraction in overall sales. 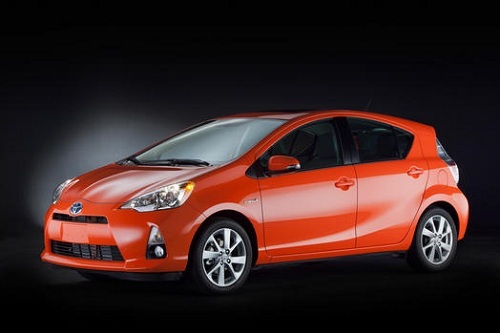 An excellent example of the hybrid sales trend for Toyota is the Prius c 12. This is the smallest of the Prius models, which have now evolved into a full line of hybrids, not just one model. Built to be primarily a city car or runabout, the ‘c is very popular in Japan and in the US. With the highest overall fuel economy in the Prius line at 53 mpg city, the ‘c is the obvious starting place for buyers. Earlier this year, David Herron of Torque News reported that the Toyota Prius c was outpacing the sales of the 2012 Chevy Volt and the 2012 Nisan Leaf. Now, based on unit volume released to the press by Toyota, it is clear that the Prius c 12 will actually sell more units than the Volt and the Leaf combined in 2012. In its first couple of months on the market the Prius c 12 sold about 9,000 units. If this volume trend continues, not only will the sales volume be a big boost to Toyota, it is easy to make the case that this model alone will save more fuel than all of the electric cars on the market combined in 2012. With a pace of just about 5,000 units per month selling, the 2012 Toyota Camry Hybrid is making a big contribution to Toyota’s overall sales. Although only about 12% of all Toyota Camry sales, at a run rate of 60,000 units per year the Camry Hybrid would be a big seller at any car company as a stand-alone model. By comparison to the Tesla roadster for example, the Toyota Camry Hybrid sold more units in its first couple of weeks this year than Tesla has produced since its inception. Furthermore, by all accounts Toyota has done this profitably. Hybrid sales were once a footnote in sales reports to be mocked by naysayers, but current volume proves these models now are an important contribution to the bottom line. Very informative article. It made me admit that Toyota had a plan, stuck with it, and it is growing; and now they are reaping the benefits as a brand. Combining an electric drive with an Atkinson Cycle IC engine, which already gets better MPG, is one combination that Detroit somehow dismissed and still do to their peril, in my opinion. Perhaps that dismissive line of thinking is why few Detroit hybrids get as good MPG in the city as the Prius. And since city driving is where we expend the most gasoline, the public realizes this and is willing to buy the car in increasing numbers. What really adds insult to injury is that the device that makes the Prius possible is an American invention-- The Power Split Device hybrid transaxle was actually invented by the American company TRW in the 1970s! Thus far the only American car company that has utilized the TRW power split device to build a hybrid car is Ford..